MPSC Assistant Engineer and Other Posts  1161 Vacancies. Maharashtra Public Service Commission (MPSC) Has recently Invited Online Application Form for the post of Assistant Executive Engineer, Assistant Engineer and Other Posts in Water Resources Department, Public Works Department and Department of Soil and Water Conservation department in Maharashtra. Those candidates who fullfills criteria and Interested they can apply form. Candidates should have Bachelor’s Degree in a relevant field from a recognized university or college. Read the notification for detailed eligibility criteria. Relaxation as per rules government of Maharashtra. Group-A Rupees15,600- 39,100 and Grade Pay Rupees 5400 + other allowances. Group-B Rupees9300- 34,800 and Grade Pay ₹4400 + other allowances will benifit. The Selection of candidates depend on exam + interview. 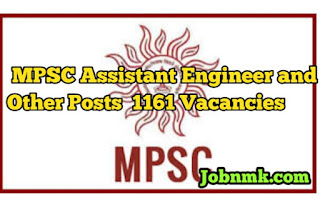 MPSC Assistant Engineer and Other Posts 1161 Vacancies. We hope you got Information about MPSC Assistant Engineer exam of Maharashtra detail.